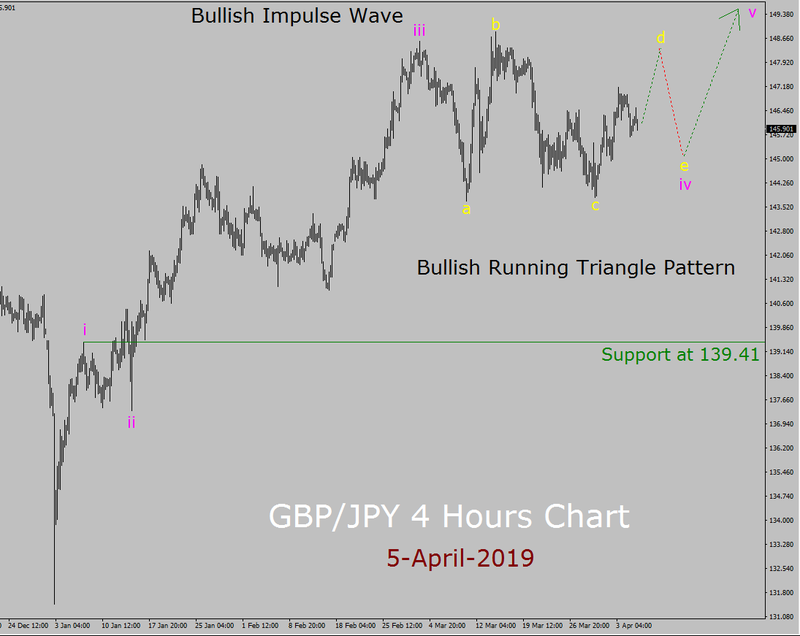 Based on technical analysis the bullish trend is present in GBP/JPY currency pair, 4 hours time frame based on GBP/JPY Elliott Wave Weekly Forecast. As I have forecasted few hours ago, the price of GBP/JPY pair is going to rise up now to prints a Bullish Impulse Elliott wave pattern and traders should look for a buy trade. So, all those Forex traders who have followed my Elliott wave forecast have made the right decision as price has ascended. Strong key support level is present at 139.41 price area which is the termination point of Bullish impulse wave i leg. In my judgment, price action in GBP/JPY currency pair is now going to move sideways to complete a Bullish Running Triangle pattern – wave iv. So, market is going to remain bullish on a medium term basis. Next, expects a bullish leg – wave v after that. Based on Elliott wave forecast, the current Bullish trend is part of a Bullish impulse Elliott wave pattern, wave 3 leg in higher time frame. Currently, Bullish Running Triangle pattern, wave iv leg looks in-complete. So, a good idea is to wait out side of the market and allow the price action to print all the Triangle legs. Next, look for a possible buy trading chance to join the up trend around 147.10 price area. However; if the price of GBP/JPY currency pair breaks below 139.41 vital support level then up trend is going to end. In such a market scenario, it would be best not to trade the Forex market and re-do the GBP/JPY Elliott wave analysis in four hours chart. Now, at this point; I must acknowledge that the trend also bullish in higher time frame of GBP/JPY currency pair. Below is the daily chart of GBP/JPY pair with my Elliott wave forecast which shows us a big picture and a well started bullish trend as well. To me; price has printed Bearish corrective wave 2 leg. So, now expect price action GBP/JPY currency pair to rise up, based on Elliott wave analysis. So, now market is moving up to complete the Bullish Impulse wave 3 leg. Next, price is going to prints a short term top. Within the Bullish Impulse Elliott wave pattern, all sub-waves must sub-divides into 5, 3, 5 3 and 5 waves pattern. Based on my GBP/JPY technical analysis using Elliott Wave in daily chart, we have got a in-complete Bullish impulse wave 3 leg. So, market is going to rise up more to prints bullish wave 3 impulse leg. However; it is possible if price breaks below green colour support line then forecast will become in-valid. Now, price action is probably going to move sideways and then rise up more to prints a Bullish Impulse wave 3 leg. To me; in four hours chart of GBP/JPY currency pair the bullish wave iii leg – Bullish impulse wave pattern which is part of a higher degree wave 3 impulse leg in daily chart is just a bullish leg in an up trend as mentioned above as wave 2 impulse wave pattern inside a daily price chart. Strong key support level is present at 122.36 price area in GBP/JPY daily chart. So, I expect market to first move sideways for next coming trading days and then may be starts the rise. So, in my opinion market is going to remain bullish overall and on a medium to long term basis, expects a sideways leg in market. Next, market is probably going to resume an up trend after that in GBP/JPY currency pair, in daily chart. Now, when an existing Bullish Elliott Wave Weekly Forecast in GBP/JPY is going to fail? Well, the forecast is good for about next two weeks time and price should stays above 122.36 support area in daily time frame to keep the up trend alive. A clear bearish break down in price action below 122.36 support area will end the up trend and bullish Elliott Wave Weekly Forecast; in such a market scenario, it would be best not to trade the market and re-analyze GBP/JPY daily chart. Based on GBP/JPY Elliott Wave Weekly Forecast the trend is up in daily chart and a good idea is to look for a buy trade around 148.95 price area, as price action is going to rise up more towards 175.55 but a clear bearish break down in price action below 122.36 vital support area will end the up trend. On a medium term basis, it is a bullish trend in GBP/JPY 4 hours time frame and a good idea is to take a buy trade around 147.10 price level and price is probably going to rise up towards 149.77 price level. However; if the price of GBP/JPY currency pair breaks below 139.41 vital support level then bullish trend is going to end. We recommend trading with these top-rated brokers when using our signals/analyses/forecasts as they handle your trades quicker and more efficiently with very low spreads and most of them have high trade execution rate.